Here are "preview" photos of a bunch of spares from my collection. Please request close-ups of anything you are interested in so you can check the fine details. Take 10% off the listed prices. Shipping will be about $4 per small package, with free shipping if your total is over $60. Condition varies and noted as follows. If you are interested in splitting up any of the sets, I would be happy to consider your offer. 687. Surface gloss is gone, decoration loss, but no chips. 688. 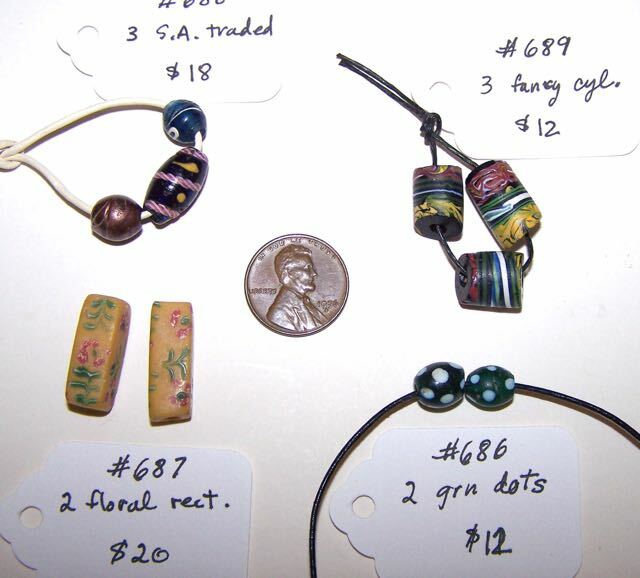 The oval bead has a rough end, the aventurine bead has an end chip, and the blue bead has a crack. 689. Some rough spots on the surface of one bead, otherwise fine, no chips.